GENERATIONS of Bradninch cricketers past and present said their fond farewells to a ‘shrewd tactician’ and long-serving clubman at the funeral of former captain Terry Newall. Newall, who has died aged 78, had a 50-year association with Bradninch CC after moving to the area in the late 1960s to work for Exeter City Council. Newall had a second career in team management from 2001 onwards and was part of a triumvirate with captain Chris Acton and overseas player Joel Murphy that moved Bradninch up from the Devon League C Division in 2003 and into the Premier Division by 2009. Bradninch have never been out of the top two divisions since 2009 and were Premier Division runners-up in 2017 – the highest placing ever achieved by the club. Derrick Foan, who played in the same Bradninch side as Newall for many years and is now chairman of the club, said his old team-mate had a keener edge as both player and captain. “Terry was that rare recruit who knew the game and knew how to win and quickly made his mark,” said Foan. “He was a shrewd and motivational captain, and the most reliable of opening batsmen, who made an art of running ones and twos long before T20. “Joining a young team in their late teens and early 20s, Terry not only fostered those quick singles, but also the closest of fielding positions when we bowled; creating enormous pressure and ensuring the opposition could not return the favour. 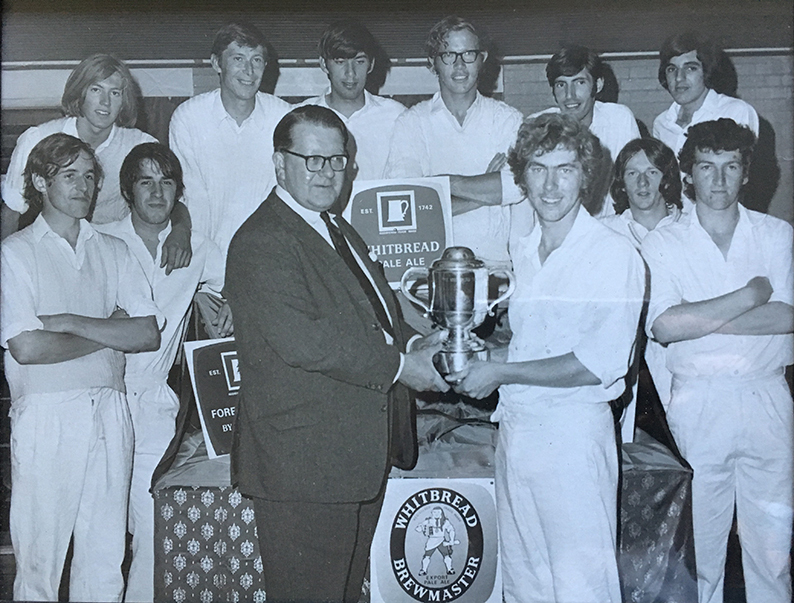 Newall put his expertise to good use helping skipper John Freeman steer Bradninch to victory in the 1970 final of the long-forgotten Whitbread Cup. Bradninch defeated a powerful Exeter Rugby Club side to reach the final. The opposition included Devon cricketers Bob Staddon and John Jenkins as well as serious club cricketers Phil Arbourne (Seaton), Roger Pugsley (Alphington), Mike Maynard (Devon Dumplings) and the Teignmouth pair John Lockyer and Owen Sharrocks. Future England rugby captain John Scott was another member of the team. Thorverton were waiting in the final at Exeter St Thomas CC and they were beaten too in a game played over two legs. “Playing a form of 20-over cricket now lost to fielding circles and power plays, we won the cup, never scoring or chasing more than 80, such was our dominance in the field,” said Foan. “The first leg was pretty well tied at 70-odd each. The second leg was curtailed by rain when we had them 30 for three after 10 overs with key man Simon Molyneux out early. Newall and his wife Sue were ever-presents around the club with current president Roy Nott and his wife Ann. “With the help of a local brewery representative, Terry installed and set up our first bar, which as for many clubs, was instrumental in attracting new members and raising funds to improve facilities,” said Foan. Although Newall moved on to golf with his son Gary in the mid-80s, he remained a keen social member and strong supporter and returned to an active role in the late 90s, when Gary moved back to Devon and called time on his professional golf career. Newall’s appointment as match manager allowed Acton to devote himself to the job of getting Bradninch up the divisions. Foan feels it was a masterstroke appointment. “The enthusiasm and intent was tangible with a youthful developing side and after a two-year winning run, we were back in the A Division primed for even greater times,” says Foan today. Newall suffered from lymphoma for the last 10 years of his life, but remained positive and took part in a clinical trial of a debilitating, but life extending treatment programme. “He did not just survive though, with all his sporting heart he continued playing golf until very recently,” said Foan. Terry Newall’s funeral took place at St Peter’s Chapel at the Exeter & Devon Crematorium. President Roy Nott his son Paul Nott, who is vice-chairman, plus many ex-players including Murphy and surviving Whitbread Cup winners Freeman, John Wingrove and Foan joined family and friends for the service. Current players and former captains Gary Chappell and Ross Acton also attended. Terry’s son Gary and daughter Penny put together the eulogy, which was delivered by the minister. Foan said it was a sad occasion, but one tinged with respect, affection and many happy memories. “Terry was the most loyal clubman and friend, and for all those young cricketers, myself included, who grew up and learnt the game of cricket under his watchful eye, let’s say a big thank you, as a very special and meaningful innings comes to a close,” said Foan.